Here is the North American Guqin Association (NAGA) 2002 News in Review. We hope in the future to organize further guqin related events, performances, publications and news. 1. 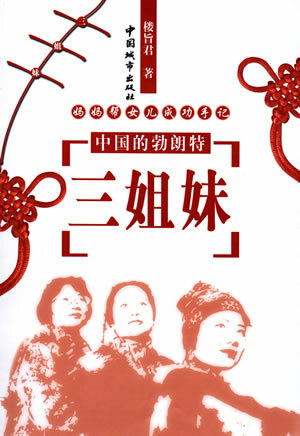 China City Publishing House published Lou Zhijun's book "The Story of the Chinese Brontë Sisters" with an accompanying CD of music by the Wang sisters on January 8 th, 2002. The CD included two tracks of guqin music by Wang Fei, director of NAGA. A total of 90,000 copies were sold in 2002, making it probably the best selling recording of guqin music ever. 2. A committee of guqin specialists was established by the China National Wind and String Music Institute. The committee includes Wang Fei and NAGA consultants Wu Zhao, Li Xiangting, Gong Yi, and Chen Changlin. 3. Li Xiangting gave a guqin presentation at the University of California at Berkeley on February 19th. 4.The first ever online guqin yaji was held by the North American Guqin Association on February 22nd, 2002. George Shen, son of the 97 year old Hong Kong qin master Tsar Teh Yun and former Chief Editor of the Hong Kong Economic Journal, wrote an article entitled "Guqin and the Internet" about it in both the Hong Kong Economic Journal Newspaper (February 25 th) and the April issue of the Hong Kong Economic Journal Monthly. 5. NAGA consultant Xu Jian's book "Qinshi Chubian" (A Preliminary History of the Qin), a major monograph on the history of the guqin, was reprinted 20 years after its original publication. 6. "Tao of Peace", the second collaboration album by Li Xiangting and American flautist Dean Evenson, was released in June 2002. 7. The North American Guqin Association and People.com.cn, the largest Chinese online news site, broadcast the first Online Guqin Concert in qin history worldwide over the Internet. You can still see the concert, listen to the interviews and read the program notes at http://www.unn.com.cn/guqin/home.htm. Li Xiangting, Wu Zhao, Xu Jian, and Chen Changlin, Wang Fei, Wang Wei , Jim Binkley , master xiao and dizi player Wang Tiechui and first class singer Jiang Jiaqiang all gave performances. Wang Chen, then Chief Editor of the People's Daily (now president of the People's Daily and a member of the Central Committee of the Communist Party of China) interviewed all the performers. Major Chinese newspapers and radio and TV stations such as the People's Daily, China Daily, Guang Ming Daily, China National Radio etc. covered the event. After the concert Li Xiangting, Wu Zhao, Wang Fei and Jim Binkley were interviewed by People.com.cn's People Forum. Please see the photos of the event. 8. The North American Guqin Association collaborated with CNN to make a television program "The Guqin In China" on July 25th in Beijing. Please see the photos of the event. 9. Wu Zhao was invited to become a consultant to the North American Guqin Association in July. 10. The first collection of improvisation performances on Chinese instruments, Li Xiangting's "Tangren Shiyi" ("Collection of Extemporizing Works of Qin and Xiao") was published on CD, and a concert and conference were held in Beijing in July. 11. "Guqin Culture Festival" and "Guqin Culture Transmission and Development" conferences were held in Beijing. Li Xiangting, Wu Zhao, Xu Jian, Chen Changlin and Wang Fei attended. Wang Fei was interviewed by BTV (a major Beijing television station) during the conference. 12.Julian Joseph attended the annual conference of the European Foundation for Chinese Music Research at Sheffield University in England in July. 13. Wang Fei, her parents and her sisters were interviewed by China National Radio about their mother's book "The Story of the Chinese Brontë Sisters" on August 2nd in Beijing. The program also introduced Wang Fei's guqin music. 14. An elegant guqin gathering (yaji) was held in the Union City Library, California, USA. Qin players from various states attended. Participants played qin, talked about qin, met qin friends, listened to qin music by various players, from different teachers or schools, played instruments made by various makers, and exchanged information on qin. 47 people attended. NAGA members Wang Fei, Jim Binkley, Pat Wong, Kwan Wong, Linda Zhao, Philip Flavin and guest Stephen Dydo played at the gathering. Amazing guitarist and major collector of guqin CDs Henry Kaiser and fantastic multi-instrumental player Jaron Lanier also attended. The NPR -KQED radio stations, the World Journal and the Epoch Times newspaper interviewed Wang Fei and covered the event. 15. Wu Zhao's qin CD "Han Gong Qiu Yue" was released by Hugo Productions of Hong Kong. 16. Gong Yi's book "Guqin Yanzoufa" (Guqin Performance Method) was revised and reprinted, and now includes a CD. 17. Jim Binkley finished a draft of his translation of Volume 2 of the Yu-ku-chai (Yu Gu Zhai) qin handbook, which deals with qin construction. A few sections from Volume 3 are also included. Postscript and HTML versions are available on his web site at http://www.cs.pdx.edu/~jrb/chin. The items we have selected relate to events held by NAGA or in which NAGA members have participated. We plan to publish the NAGA News in Review every year. If you are a member (that is, you have registered by filling in the form at http://www.chineseculture.net/guqin/joinus.html) and you have any interesting news, please email us and tell us about it. If you are not a member (you are on this mailing list but have not filled in the form) please feel free to join. There is no charge. © 1997-2003 North American Guqin Association, All Rights Reserved.